Sometimes it's easy to make a mistake when picking a photo of an animal — presenting an image of a rat instead of a mouse, for example. Or mistaking a crane fly for a mosquito. 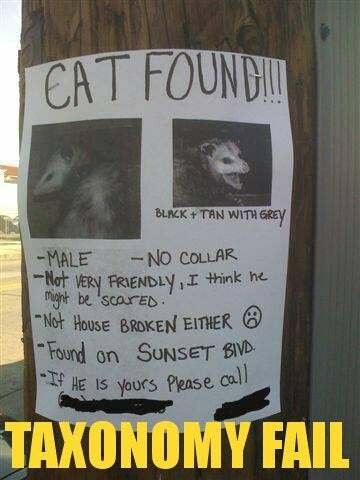 But whoever made this missing cat poster has taken the crown for animal mis-classification. Where T = the number of million years since the two species (the correct species and the species an organism is misidentified as) shared a common ancestor; and H = the number of million years since humans and our closest relatives, the chimps, shared a common ancestor (about 6.4). The yellow jacket/honey bee fail...has a TFI of 25.2, or slightly stupider than mistaking an opossum for a cat. Let's try putting the equation to work, shall we? This image is from a post I wrote back in August about how rats were not actually responsible for the Black Death. The image features what I thought was a black rat (Rattus rattus) — but commenter mikeiko seemed to think that I had failed by "putting a pet fancy rat on the picture, which is a Brown rat [Rattus norvegicus], rather than...[a] Black Rat [Rattus rattus]."